Tuvalu Envoy Takes Up Global Warming Fight U.N. 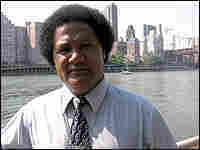 Ambassador Afelee Pita left his island nation of fewer than 12,000 people to take up its cause in Manhattan, an island city of millions. Tuvalu's highest point is 13 feet above sea level. Global warming means more storms and a rising sea. Earlier this spring in New York, the United Nations Security Council held a special session to take up the issue of climate change. For the first time, the U.N. was defining global warming as a threat to the security of nations — every bit as dangerous as war or nuclear weapons. Among those who spoke was one of the newest ambassadors to the U.N.: Afelee Pita, from the tiny Pacific island nation of Tuvalu. His nation is made up of nine, low-lying coral islands. He said it's absolutely correct to think of climate change as a threat to the security of his country. "The world has moved from a global threat once called the Cold War, to what now should be considered the Warming War," Pita told the Security Council. "Our conflict is not with guns and missiles but with weapons from everyday lives — chimney stacks and exhaust pipes." Tuvalu's fear is that ocean waters will rise, cyclones will grow more intense, people will be forced to move to other countries, and Tuvalu — along with its way of life — will disappear. "We face many threats associated with climate change," Pita said to the U.N. "Ocean warming is changing the very nature of our island nation. Slowly our coral reefs are dying through coral bleaching. We are witnessing changes to fish stocks. And we face the increasing threat of more severe cyclones. With the highest (land) point of four meters above sea level, the threat of more cyclones is extremely disturbing." To get heard at the U.N., Tuvalu used a bit of good fortune. The country was assigned the Internet country suffix TV. So it sells that to people who want a "dot-TV" Web site. The first things Tuvalu did with the windfall: It paved the main road — just five miles long — and sent an ambassador to the United Nations. Pita is Tuvalu's second ambassador to the U.N.; his appointment is for three years. But the money is running out and Tuvalu's delegation of five is about to be reduced to just two — Pita and his wife. As a result, he fears he won't get home to Tuvalu until those three years are up. "By the look at our current situation now, it seems that would be impossible for me to go on leave because there's no other deputy that can take over the office if I go on leave," he explained, speaking from his small office near the U.N. So Ambassador Pita, a man from one of the tiniest island countries in the world, with a population of just 12,000, is now stranded on one of the world's most crowded islands: Manhattan. When he arrived in New York six months ago, it was cold and icy. He's still homesick for Tuvalu. "Back home, I can be out there in one of the islets, nothing to worry about, enjoying the beach," he says of Tuvalu. "I can see the blue lagoon, and you can go out fishing. Whatever I can have, enough for a meal. Easy life." The Pacific island country he left is so small that when the 30-seater turboprop flies on Mondays and Thursdays, young men run out to the landing strip and take down the soccer goal posts. Pita says it's hard to think of New York as an island. He laughs and says New York is a "very complicated island. You know. What I do here is so different, totally different from what you can do back home. Because here, although it's an island, it's an island with so many tall buildings everywhere you go. And I think this is not actually the unique features of an island." Pita's speech before the U.N. Security Council was his most important moment in the months he has been ambassador. But there is a lot more work to do. There is some debate among scientists about just how much global warming threatens Tuvalu. Harsh weather has always been a fact of life in the Pacific. So Pita has appealed to the U.N., the United States and the World Bank to start a fund, so that there will be money to rebuild in case of any natural disaster. Since coming to New York, Pita has had no time for sightseeing. He drives — an SUV — to his office, to his home, to his kids' elementary school, and then back again. Before arriving in New York, he heard his address would be Roosevelt Island. That gave him some faint hope. But Roosevelt Island is no Polynesian-style paradise. It's a New York island, a busy neighborhood in the middle of the East River. Home is an apartment on the 12th floor of a brick building. Still, from his balcony, Pita sees water. Not the water of Tuvalu – such a clear blue you can see colorful fish swimming — but it's water, and Pita appreciates that. "I think what is important is that you feel at home when you live closer to the waters," he says. So after work, he likes to stroll along the East River. He has a spot where he can hear the water. In front of him is a majestic panorama of glass, steel and concrete skyscrapers — each seeming to jostle for a piece of the city skyline. Here, at the walking path, dark waves lap at the shore barriers of cement and stone, about six feet below. That's about as high as it gets above the water in most of Tuvalu, he notes. "And just imagine if one tidal wave strikes here without any other higher grounds on the island," he says. "You don't have any other alternative place to go to." For Pita, Tuvalu is more than a dot on a map. It's a way of life, where people and nature live in a harmony that hasn't changed much in 2,000 years. He calls this the simple life. "Living the simple lifestyle with a simple environment, depending on the nature of your surrounding environment — to me, I live more happier living in that kind of environment rather than living in a tall building somewhere in Manhattan," he says with a soft laugh. And to protect that life, Ambassador Afelee Pita keeps trying to tell the world about the threat that climate change poses to one tiny nation of coral islands, in one of the most remote spots in the Pacific Ocean.